Crystal Zevon, a videographer, is deeply involved with Defenders of the Black Hills efforts to ban uranium mining and has spent several weeks at Standing Rock, supporting the Water Protectors in their struggle against the Dakota Access pipeline project. Here is her interview. 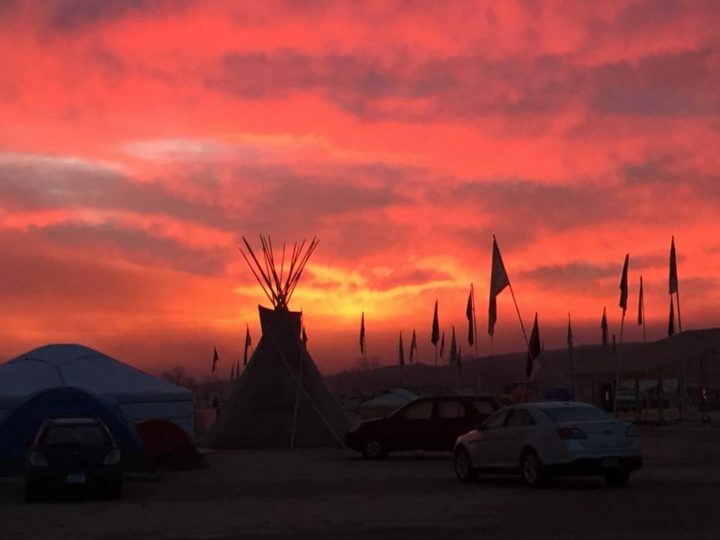 What atmosphere did you find at Standing Rock? I was at Standing Rock twice. The first time was in October and November, before it got very cold. From the minute we entered the Oceti Sakowin Camp (the main camp, now called All Nations Camp), we were welcomed. People were very helpful, letting us know where the kitchens were, were donation tents were (both to leave the donations we brought and where we would find things if we had need), were the main sacred fire was always lit and where prayers, ceremony and information were given out on a regular basis. Having lived in a tent in Washington D.C. for 4 months during the Occupy movement, the atmosphere felt familiar, and yet there was something quite different. I quickly realized that because the camps at Standing Rock have a strong spiritual foundation, things ran more smoothly. People had patience. There were smiles, and helpful attitudes throughout. When Indigenous customs were unfamiliar, there was always someone nearby to explain. The day my friends and I arrived at the camp, some 500 interfaith leaders also arrived. The sense of solidarity and desire to embrace all faiths was apparent. We participated in several interfaith ‘actions’, all of which were peaceful and prayerful. There was even a forgiveness walk where we walked from a park in Bismarck to the sheriff’s office and shook hands with and even hugged the police officers offering forgiveness for the harsh treatment many had received by the police, and apologies for any transgressions on the part of the Water Protectors. My second visit was in December when the veterans arrived. It was brutally cold and the camps were overrun with tens of thousands of people wanting to help. Again, everyone was welcomed and treated well and with respect, but there was also a tension because there were too many people to orient to the ways of the Lakota right away. The veterans who were not staying at camp were not well organized and it did create a different atmosphere. That said, the prayer and ceremony outweighed any and all negativity. I was at the sacred fire when Chairman Dave Archambault announced that the US Army Corps of Engineers had denied the easement. There was a sense of tremendous relief and celebration. However, the very next day, the company that owns the Dakota Access Pipeline, Energy Transfer Partners, filed to be able to continue drilling, and it was clear that the Water Protectors’ job is not done. What prompted you to support the fight of the natives against the pipeline? I think the question should read ‘what prompted me to support the Water Protectors in their struggle to maintain clean water for all, save sacred sites and burial grounds from desecration, and reclaim treaty territory?’ I have been working with Indigenous people for some years now. Together, we created an organization called Clean Up the Mines (www.cleanupthemines.org) and have a bill ready to go to Congress to clean up the 15,000 abandoned uranium mines in the United States. One of the women we work with, Charmaine White Face, is Oglala Lakota Sioux, and another, Klee Benally, is Navajo. Through them, I have learned a great deal about Indigenous culture and I have come to believe that the solutions to the problems of climate change, pollution, etc. could be solved if we would only listen to Native wisdom, change the way we live to heal the earth rather than to continue to hard her. I was particularly drawn to go to Standing Rock because something historic was happening. People came from all around the world. Tribes who were former enemies were coming together. From the moment I arrived, I was changed. The feeling of prayer was strong… the sense that together we could begin to heal the earth felt palpable. Is there any situation during your stay that particularly struck you? My favorite moment was after an action where about 700 of us went to a parking lot where the DAPL security and workers park to pray… the Indigenous and people of color formed a circle and had a medicine wheel ceremony. All the white allies formed an outer circle to protect the prayer circle. The police came and hemmed us in on all sides, but they did not move against us. The next day, we had a debrief and a Lakota man stood and said, “I have been here from the beginning, for many months now. Until yesterday, we have never finished a prayer ceremony. The police have always attacked. So, to you white people who stood between us and the police, you are no longer our allies. You are our relations. You are our brothers and sister.” I was deeply moved, and the sense of relationship has remained strong with me. What is in your opinion the value given to nonviolence in this fight? I believe what has given strength and credibility to this movement is the commitment to prayer and non-violence. The police continue to say there is violence on the part of the Water Protectors. In almost a month and 2 stays at the camps, I never saw an incidence of violence. Violence only creates more violence. Love wins. How do you see the future of this fight, now that Trump has announced his support to the pipeline project? I do not think the nature of the fight on the part of the Water Protectors will change greatly. They are committed. This is about saving the earth for future generations. My fear is knowing that the Lakota will remain to the death. Sadly, I do not put it past Trump, or the Morton County Sheriffs, to kill people. Everything is going to be harder with Trump, but I know those of us who love this earth must join hands and continue to protect her with every fiber of our being.